Imagine you designed a logo beloved by an entire country, that appeared everywhere on hats and jerseys and on television, and no one knew you had done it. Such was the fate of Jerry Dior, designer of the Major League Baseball (MLB) logo, for thirty years. Dior designed the logo in 1968 while working at the New York marketing firm Sandgren and Murtha. At the time, he didn’t think much about the job. His brief was to make a nondescript baseball player, which he sketched up in magic marker (originally blue and green) over the course of an afternoon. Knowing that clients frequently alter a design beyond recognition in the years and decades after adopting it, Dior did not bother to keep a record of his creation. Yet there it was thirty years on, essentially unchanged (the only difference is that they made the nose pointier, “which I hate,” Dior says). Understandably, he began to seek recognition, but there seemed to exist no hard proof that he had been the artist. Finally, after a series of colleagues attested to the fact that he had done it, the MLB carried out an independent investigation and acknowledged his contribution in 2009. The only difference is that Dior designed a player with a squarer nose, as is clear in this original version. With the National Hockey League (NHL) and National Basketball Association (NBA) finals currently underway (go Warriors! ), we’ve got sports on the brain. So we thought we would honor the memory of Dior, who passed away last month, by investigating the origin stories of America’s other major leagues’ sports logos. We’ll take a look at the NHL, NBA, National Football League (NFL) and Major League Soccer (MLS). It turns out each of them has a story to tell. Founded in 1917, the National Hockey League is the oldest national sports league in America after the MLB, which began in 1903. While the MLB logo’s 36 year run (and counting) is certainly impressive, it has a way to go until it catches up to the NHL’s black and orange logo from 1936, which lasted no less than 68 years unchanged. In 2004, the league finally decided it was time to change things up, so its in-house creative department, consulting with the sports branding firm SME, created a new black-and-silver version. The changes were fairly minor—they reversed the direction of the slash, made the typeface a little fancier, added a second border line, and lengthened the badge’s points. They also added a web 2.0-style shine effect, resulting in a logo that, unlike its predecessor, has come to look dated in only ten years. D’oh! The NBA logo, designed by Alan Siegel in 1969 to resemble Dior’s MLB logo. 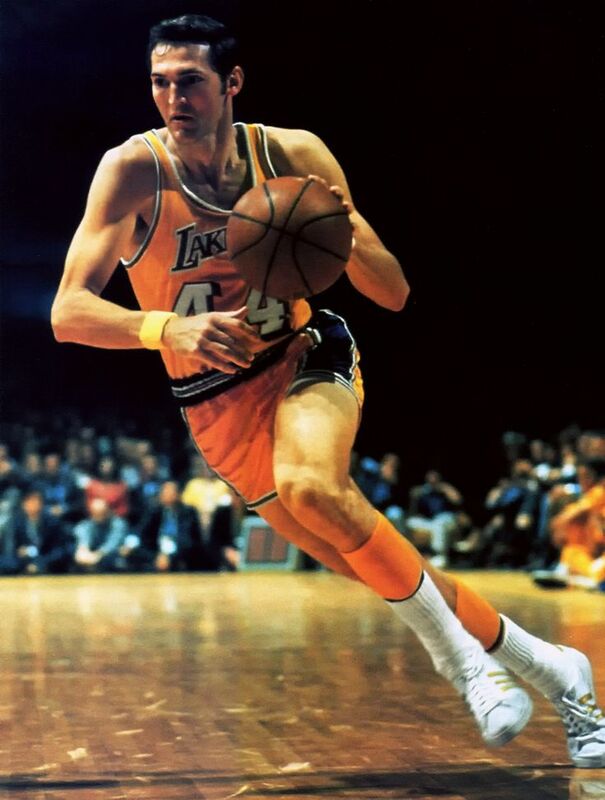 Siegel makes no bones about the fact that his silhouette is based on photographs of Jerry West. Siegel, founder of the branding agency Siegel+Gale, designed the logo in 1969, the same year that Dior’s remarkably similar-looking logo came out. As Siegel has explained, the similarity was not a coincidence: the NBA commissioner at the time expressly asked Siegel to riff on the patriotic MLB logo as a way of branding basketball as an “all American” sport like baseball. 36 years later, the NBA logo remains unchanged—short shorts, socks, high-top sneakers and all. To this day, the author of the NFL’s original 1960 logo remains anonymous, but we do know that he or she was on the league’s in-house creative team. It has been re-designed twice since then, with the most radical change occurring in 2008. The new logo simplifies itself by reducing the number of stars. It also gives the football icon a bit more three-dimensionality and loses the 60s curly font. The straight, blocky letters look a touch awkward in their still curvaceous home, but other than that the redesign is a strong one. Founded in 1993, Major League Soccer is a relative newcomer to the American sports scene, where the sport has never been anywhere near as popular as it is in the rest of the world. Still, the league consists of twenty teams, giving it a solid presence and a real need for a strong brand identity. Between 1994 and 2002, the original logo—a cleated shoe kicking a ball—went through a number of underwhelming iterations and color changes. The 2000 version of the MLS logo is only a slight alteration from the original 1994 design. In 2014, the league rolled out its new logo, designed in-house with the aid of the agencies Gigunda, Athletics and Berliner Benson. The new logo is radically minimalist, consisting of a simple crossed shield, corner wordmark and, as MLS’ diagram (above) so helpfully points out, stars. By itself it is a bit underwhelming, and received a lot of backlash for this reason. But we think the logo has its merits. For example, it looks great in its various club versions, which are keyed to a specific teams’ colors. It also looks fantastic in ads. Clearly, the practice of sports league logo design is far from retired. No doubt there are many more stories like Dior’s waiting to be told. Which sports league logo designs do you think are the most timeless? Share in the comments! Very interesting, just shows how important it is to keep the original artworks.